PART I- Why Obtain an Engineering Ph.D.? 1. Motivation for Obtaining the Ph.D.
2. 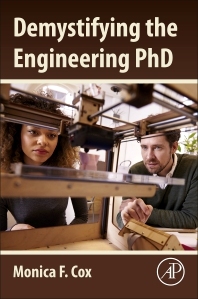 The Added Value of the Ph.D.
Part II- What Do Engineering Ph.D. Holders Do? Part III- What Are the Expectations of Engineering Ph.D. Holders? •	PECASE – 2008 Presidential Early Career Award for Scientists and Engineers •	NSF CAREER Award (Faculty Early Career Development) •	2008 Diverse: Issues In Higher Education magazine “Emerging Scholar.” •	VaNTH Engineering Research Center Student Leadership Council Chairperson (2001-2005) •	First African-American female engineering faculty member hired at Purdue University •	Since 2005, she has worked with teams of multidisciplinary researchers to earn over $10 million in research funding from the NSF with approximately $1.4 million as principal investigator. She has written ~ 80 scholarly publications and has given invited talks about her experiences and research in the U.S. and in Mexico.